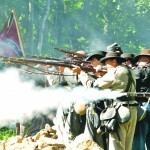 The annual Civil War Battle of Baton Rouge commemorative ceremony, a free family oriented event, will be held in the Historic Magnolia Cemetery, Florida Boulevard and 19th Street, on Saturday, Aug. 1 from 10 a.m. to 11 a.m. honoring the August 5, 1862 Battle of Baton Rouge. The guest speaker, Marvin Steinbach, Port Hudson State Historic Site Interpretive Ranger, will discuss the 9th Battalion Louisiana Infantry that participated in the Battle of Baton Rouge under the leadership of Major B. R. Chinn. Rabenhorst Funeral Home is providing two tents placed under the oak trees of the historic cemetery and hand fans, and BREC is supplying chairs and water. The Battle of Baton Rouge took place on August 5, 1862, on Magnolia Cemetery’s grounds. At 4 a.m. that day, CSA Major Gen. John C. Breckinridge and his 2,600 Confederate troops entered Baton Rouge, trying to reclaim the city from Union occupation. The Confederate Army forced the Union troops back toward the Mississippi River. An integral part of the Confederate battle plan was the prompt arrival of the iron clad ram, the CSS Arkansas, to destroy Union ships on the river. However, the Arkansas suffered engine trouble and had to be burned and set adrift. Unharmed, the USS Essex and other Union gunboats bombarded the Confederate troops until they withdrew from Baton Rouge that same day. The two sides each suffered 84 killed. Union Brig. Gen. Williams and CSA Lt. Alex Todd, half-brother of Mary Todd Lincoln, were among the fallen soldiers.